This article is about the river. For other uses, see Zambezi (disambiguation). The river rises in a black marshy dambo in dense undulating miombo woodland 50 kilometres (31 mi) north of Mwinilunga and 20 kilometres (12 mi) south of Ikelenge in the Ikelenge District of North-Western Province, Zambia at about 1,524 metres (5,000 ft) above sea level. The area around the source is a national monument, forest reserve and Important Bird Area. Eastward of the source, the watershed between the Congo and Zambezi basins is a well-marked belt of high ground, running nearly east-west and falling abruptly to the north and south. This distinctly cuts off the basin of the Lualaba (the main branch of the upper Congo) from that of the Zambezi. In the neighborhood of the source the watershed is not as clearly defined, but the two river systems do not connect. The river flows to the southwest into Angola for about 240 kilometres (150 mi), then is joined by sizeable tributaries such as the Luena and the Chifumage flowing from highlands to the north-west. It turns south and develops a floodplain, with extreme width variation between the dry and rainy seasons. It enters dense evergreen Cryptosepalum dry forest, though on its western side, Western Zambezian grasslands also occur. Where it re-enters Zambia it is nearly 400 metres (1,300 ft) wide in the rainy season and flows rapidly, with rapids ending in the Chavuma Falls, where the river flows through a rocky fissure. The river drops about 400 metres (1,300 ft) in elevation from its source at 1,500 metres (4,900 ft) to the Chavuma Falls at 1,100 metres (3,600 ft), in a distance of about 400 kilometres (250 mi). From this point to the Victoria Falls, the level of the basin is very uniform, dropping only by another 180 metres (590 ft) in a distance of around 800 kilometres (500 mi). 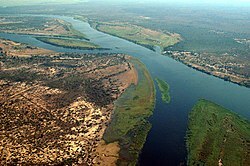 The first of its large tributaries to enter the Zambezi is the Kabompo River in the northwestern province of Zambia. A major advantage of the Kabompo River was irrigation. The savanna through which the river has flowed gives way to a wide floodplain, studded with Borassus fan palms. A little farther south is the confluence with the Lungwebungu River. This is the beginning of the Barotse Floodplain, the most notable feature of the upper Zambezi, but this northern part does not flood so much and includes islands of higher land in the middle. A short distance downstream of the confluence with the Luanginga is Lealui, one of the capitals of the Lozi people who populate the Zambian region of Barotseland in Western Province. The chief of the Lozi maintains one of his two compounds at Lealui; the other is at Limulunga, which is on high ground and serves as the capital during the rainy season. The annual move from Lealui to Limulunga is a major event, celebrated as one of Zambia's best known festivals, the Kuomboka. After Lealui, the river turns to south-south-east. From the east it continues to receive numerous small streams, but on the west is without major tributaries for 240 km. Before this, the Ngonye Falls and subsequent rapids interrupt navigation. South of Ngonye Falls, the river briefly borders Namibia's Caprivi Strip. The strip projects from the main body of Namibia, and results from the colonial era: it was added to German South-West Africa expressly to give Germany access to the Zambezi. The Victoria Falls are considered the boundary between the upper and middle Zambezi. Below them the river continues to flow due east for about 200 kilometres (120 mi), cutting through perpendicular walls of basalt 20 to 60 metres (66 to 200 ft) apart in hills 200 to 250 metres (660 to 820 ft) high. The river flows swiftly through the Batoka Gorge, the current being continually interrupted by reefs. It has been described as one of the world's most spectacular whitewater trips, a tremendous challenge for kayakers and rafters alike. Beyond the gorge are a succession of rapids which end 240 km (150 mi) below Victoria Falls. Over this distance, the river drops 250 metres (820 ft). The Luangwa and the Kafue are the two largest left-hand tributaries of the Zambezi. The Kafue joins the main river in a quiet deep stream about 180 metres (590 ft) wide. From this point the northward bend of the Zambezi is checked and the stream continues due east. At the confluence of the Luangwa (15°37' S) it enters Mozambique. The lower Zambezi's 650 km from Cahora Bassa to the Indian Ocean is navigable, although the river is shallow in many places during the dry season. This shallowness arises as the river enters a broad valley and spreads out over a large area. Only at one point, the Lupata Gorge, 320 km from its mouth, is the river confined between high hills. Here it is scarcely 200 m wide. Elsewhere it is from 5 to 8 km wide, flowing gently in many streams. The river bed is sandy, and the banks are low and reed-fringed. At places, however, and especially in the rainy season, the streams unite into one broad fast-flowing river. About 160 km from the sea the Zambezi receives the drainage of Lake Malawi through the Shire River. On approaching the Indian Ocean, the river splits up into a delta. Each of the four primary distributaries, Kongone, Luabo and Timbwe, is obstructed by a sand bar. A more northerly branch, called the Chinde mouth, has a minimum depth at low water of 2 m at the entrance and 4 m further in, and is the branch used for navigation. 100 km further north is a river called the Quelimane, after the town at its mouth. This stream, which is silting up, receives the overflow of the Zambezi in the rainy season. The delta of the Zambezi is today about half as broad as it was before the construction of the Kariba and Cahora Bassa dams controlled the seasonal variations in the flow rate of the river. Before the dams were built seasonal flooding of the Zambezi had quite a different impact on the ecosystems of the delta from today as it brought nutritious fresh water down to the Indian Ocean coastal wetlands. The lower Zambezi experienced a small flood surge early in the dry season as rain in the Gwembe catchment and north-eastern Zimbabwe rushed through while rain in the Upper Zambezi, Kafue, and Lake Malawi basins, and Luangwa to a lesser extent, is held back by swamps and floodplains. The discharge of these systems contributed to a much larger flood in March or April, with a mean monthly maximum for April of 6,700 cubic metres (240,000 cu ft) per second at the delta. The record flood was more than three times as big, 22,500 cubic metres (790,000 cu ft) per second being recorded in 1958. By contrast the discharge at the end of the dry season averaged just 500 cubic metres (18,000 cu ft) per second. traditional farming and fishing patterns disrupted. As well as the Zambezi this section applies to the Buzi, Pungwe, and Save rivers which also drain the Zambezi basin. Together the floodplains of these four rivers make up the World Wildlife Fund's Zambezian coastal flooded savanna ecoregion. They are a mixture of open grassland and freshwater swamp inland from the Indian Ocean in Mozambique. Although the dams have stemmed some of the annual flooding of the lower Zambezi and caused the area of floodplain to be greatly reduced they have not removed flooding completely. They cannot control extreme floods, they have only made medium-level floods less frequent. When heavy rain in the lower Zambezi combines with good runoff upstream, massive floods still happen and the wetlands are still an important habitat. However, as well as the shrinking of the wetlands further severe damage to wildlife was caused by uncontrolled hunting of animals such as buffalo and waterbuck during the Mozambique Civil War and now the conflict has ceased it is likely the floodplains will become more populated, and further damming has also been discussed. The only protected area of floodplain is the Marromeu Game Reserve near the city of Beira. Although the region has seen a reduction in the populations of the large mammals, it is still home to some including the reedbuck and migrating eland. Carnivores found here include lion (Panthera leo), leopard (Panthera pardus), cheetah (Acinonyx jubatus), spotted hyena (Crocuta crocuta) and side-striped jackal (Canis adustus). The floodplains are a haven for migratory waterbirds including pintails, garganey, African openbill (Anastomus lamelligerus), saddle-billed stork (Ephippiorhynchus senegalensis), wattled crane ("Bugeranus carunculatus"), and great white pelican (Pelecanus onocrotalus). Reptiles include Nile crocodile (Crocodylus niloticus), Nile monitor lizard (Varanus niloticus) and African rock python (Python sebae), the endemic Pungwe worm snake (Leptotyphlops pungwensis) and three other snakes that are nearly endemic; floodplain water snake (Lycodonomorphus whytei obscuriventris), dwarf wolf snake (Lycophidion nanus) and eyebrow viper (Proatheris). There are a number of endemic butterflies. The north of the Zambezi basin has mean annual rainfall of 1100 to 1400 mm which declines towards the south, reaching about half that figure in the south-west. The rain falls in a 4-to-6-month summer rainy season when the Inter-Tropical Convergence Zone moves over the basin from the north between October and March. Evaporation rates are high (1600 mm-2300 mm) and much water is lost this way in swamps and floodplains, especially in the south-west of the basin. The river supports large populations of many animals. Hippopotamuses are abundant along most of the calm stretches of the river, as well as Nile crocodiles. Monitor lizards are found in many places. Birds are abundant, with species including heron, pelican, egret and African fish eagle present in large numbers. Riverine woodland also supports many large animals, such as buffalo, zebras, giraffes, elephants. The Zambezi also supports several hundred species of fish, some of which are endemic to the river. Important species include cichlids which are fished heavily for food, as well as catfish, tigerfish, yellowfish and other large species. The bull shark is sometimes known as the Zambezi shark after the river, but is found around the world. Source: Beilfuss & Dos Santos (2001) The Okavango Basin is not included in the figures because it only occasionally overflows to any extent into the Zambezi. Due to the rainfall distribution, northern tributaries contribute much more water than southern ones, for example: the Northern Highlands catchment of the upper Zambezi contributes 25%, Kafue 8%, Luangwa and Shire Rivers 16% each, total 65% of Zambezi discharge. The large Cuando basin in the south-west on the other hand contributes only about 2 m3/s because most is lost through evaporation in its swamp systems. The 1940s and 1950s were particularly wet decades in the basin. Since 1975, it has been drier, the average discharge being only 70% of that for the years 1930 to 1958. Up to the Late Pliocene or Pleistocene (more than two million years ago), the Upper Zambezi river used to flow south through what is now the Makgadikgadi Pan to the Limpopo River. The change of the river course is the result of epeirogenic movements that uplifted the surface at the present-day water divide between both rivers. Meanwhile, 1,000 kilometres (620 mi) east, a western tributary of the Shire River in the East African Rift's southern extension through Malawi eroded a deep valley on its western escarpment. 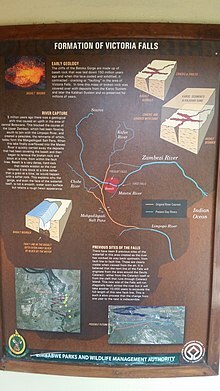 At the rate of a few cm per year, this river, the Middle Zambezi, started cutting back the bed of its river towards the west, aided by grabens (rift valleys) forming along its course in an east-west axis. As it did so it captured a number of south-flowing rivers such as the Luangwa and Kafue. The first European to come across the Zambezi river was Vasco da Gama, in January 1498, who anchored at what he called Rio dos Bons Sinais ("River of Good Omens"), now the Quelimane or Quá-Qua, a small river on the northern end of the delta, which at that time was connected by navigable channels to the Zambezi river proper (the connection silted up by the 1830s). In a few of the oldest maps, the entire river is denoted as such. But already by the early 1500s, a new name emerged, the Cuama river (sometimes "Quama" or "Zuama"). Cuama was the local name given by the dwellers of the Swahili Coast for an outpost located on one the southerly islands of the delta (near the Luabo channel). Most old nautical maps denote the Luabo entry as Cuama, the entire delta as the "rivers of Cuama" and the Zambezi river proper as the "Cuama River". Nonetheless, already in 1552, Portuguese chronicler João de Barros notes that the same Cuama river was called Zembere by the inland people of Monomatapa. The Portuguese Dominican friar João dos Santos, visiting Monomatapa in 1597, reported it as Zambeze (Bantu languages frequently shifts between z and r) and inquired into the origins of the name; he was told it was named after a people. Map by Willem Janszoon Blaeu, dated 1635, showing the course of the Zambezi, and its source in a great lake. Thus the term "Zambezi" is after a people who live by a great lake to the north. The most likely candidates are the "M'biza", or Bisa people (in older texts given as Muisa, Movisa, Abisa, Ambios and other variations), a Bantu people who live in what is now central-eastern Zambia, between the Zambezi River and Lake Bangweolo (at the time, before the Lunda invasion, the Bisa would have likely stretched further north, possibly to Lake Tanganyika). The Bisa had a reputation as great cloth traders throughout the region. In a curious note, the Goese-born Portuguese trader Manuel Caetano Pereira, who traveled to the Bisa homelands in 1796 was surprised to be shown a second, separate river referred to as the "Zambezi". This "other Zambezi" that puzzled Pereira is most likely what modern sources spell the Chambeshi River in northern Zambia. The Monomatapa notion (reported by Santos) that the Zambezi was sourced from a great internal lake might be a reference to one of the African Great Lakes. One of the names reported by early explorers for Lake Malawi was "Lake Zambre" (probably a corruption of "Zambezi"), possibly because Lake Malawi is connected to the lower Zambezi via the Shire River. The Monomatapa story resonated with the old European notion, drawn from classical antiquity, that all the great African rivers—the Nile, the Senegal, the Congo, now the Zambezi, too—were all sourced from the same great internal lake. The Portuguese were also told that the Mozambican Espirito Santo "river" (actually an estuary formed by the Umbeluzi, Matola and Tembe rivers) was sourced from a lake (hence its outlet became known as Delagoa Bay). As a result, several old maps depict the Zambezi and the "Espirito Santo" rivers converging deep in the interior, at the same lake. However, the Bisa-derived etymology is not without dispute. In 1845, W.D. Cooley, examining Pereira's notes, concluded the term "Zambezi" derives not from the Bisa people, but rather from the Bantu term "mbege"/"mbeze" ("fish"), and consequently it probably means merely "river of fish". David Livingstone, who reached the upper Zambezi in 1853, refers to it as "Zambesi" but also makes note of the local name "Leeambye" used by the Lozi people, which he says means "large river or river par excellence". Livingstone records other names for the Zambezi—Luambeji, Luambesi, Ambezi, Ojimbesi and Zambesi—applied by different peoples along its course, and asserts they "all possess a similar signification and express the native idea of this magnificent stream being the main drain of the country". In Portuguese records, the "Cuama River" term disappeared and gave way to the term "Sena River" (Rio de Sena), a reference to the Swahili (and later Portuguese) upriver trade station at Sena. In 1752, the Zambezi delta, under the name "Rivers of Sena" (Rios de Sena) formed a colonial administrative district of Portuguese Mozambique. But common usage of "Zambezi" led eventually to a royal decree in 1858 officially renaming the district "Zambézia". The Zambezi region was known to medieval geographers as the Empire of Monomotapa, and the course of the river, as well as the position of lakes Ngami and Nyasa, were given broadly accurately in early maps. These were probably constructed from Arab information. The first European to visit the inland Zambezi river was the Portuguese degredado António Fernandes in 1511 and again in 1513, with the objective of reporting on commercial conditions and activities of the interior of Central Africa. The final report of these explorations revealed the importance of the ports of the upper Zambezi to the local trade system, in particular to East African gold trade. The first exploration of the upper Zambezi was made by David Livingstone in his exploration from Bechuanaland between 1851 and 1853. Two or three years later he descended the Zambezi to its mouth and in the course of this journey discovered the Victoria Falls. During 1858–60, accompanied by John Kirk, Livingstone ascended the river by the Kongone mouth as far as the Falls, and also traced the course of its tributary the Shire and reached Lake Malawi. For the next 35 years very little exploration of the river took place. Portuguese explorer Serpa Pinto examined some of the western tributaries of the river and made measurements of the Victoria Falls in 1878. In 1884 the Plymouth Brethren missionary Frederick Stanley Arnot traveled over the height of land between the watersheds of the Zambezi and the Congo, and identified the source of the Zambezi. He considered that the nearby high and cool Kalene Hill was a particularly suitable place for a mission. Arnot was accompanied by the Portuguese trader and army officer António da Silva Porto. In 1889 the Chinde channel north of the main mouths of the river was discovered. Two expeditions led by Major A. St Hill Gibbons in 1895 to 1896 and 1898 to 1900 continued the work of exploration begun by Livingstone in the upper basin and central course of the river. Two local people in the Zambezi river near Victoria falls, Zambia. 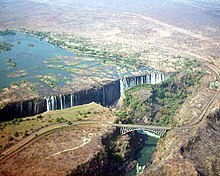 The population of the Zambezi river valley is estimated to be about 32 million. About 80% of the population of the valley is dependent on agriculture, and the upper river's flood plains provide good agricultural land. Communities by the river fish it extensively, and many people travel from far afield to fish. Some Zambian towns on roads leading to the river levy unofficial 'fish taxes' on people taking Zambezi fish to other parts of the country. As well as fishing for food, game fishing is a significant activity on some parts of the river. Between Mongu and Livingstone, several safari lodges cater for tourists who want to fish for exotic species, and many also catch fish to sell to aquaria. The river valley is rich in mineral deposits and fossil fuels, and coal mining is important in places. The dams along its length also provide employment for many people near them, in maintaining the hydroelectric power stations and the dams themselves. Several parts of the river are also very popular tourist destinations. Victoria Falls receives over 100,000 visitors annually, with 141,929 visitors reported in 2015. Mana Pools and Lake Kariba also draw substantial tourist numbers. The river is frequently interrupted by rapids and so has never been an important long-distance transport route. David Livingstone's Zambezi Expedition attempted to open up the river to navigation by paddle steamer, but was defeated by the Cahora Bassa rapids. Along some stretches, it is often more convenient to travel by canoe along the river rather than on the unimproved roads which are often in very poor condition due to being regularly submerged in flood waters, and many small villages along the banks of the river are only accessible by boat. In the 1930s and 40s a paddle barge service operated on the stretch between the Katombora Rapids, about 50 kilometres (31 mi) upstream from Livingstone, and the rapids just upstream from Katima Mulilo. However, depending on the water level, boats could be paddled through—Lozi paddlers, a dozen or more in a boat, could deal with most of them—or they could be pulled along the shore or carried around the rapids, and teams of oxen pulled barges 5 kilometres (3.1 mi) over land around the Ngonye Falls. Lubosi Imwiko II Bridge linking the towns of Mongu and Kalabo, a new 1,005 meter long concrete/steel road bridge including 38.5 km of embanked highway through Barotse Floodplain constructed between 2011 and 2016 by Chinese company (2nd attempt) of 1.2 trillion kwacha. Sioma Bridge near the Ngonye Falls, anew 260 metres long road bridge (K 108 mln), opened in 2016 as part of the Sesheke - Senanga road. Tourist boat on the Zambezi River, Mosi-oa-Tunya National Park, Zambia. 1971 photo. Dona Ana Bridge, originally railway but converted to single-lane road, (1935), the longest at 3 kilometres (1.9 mi), since late 2009 it is again a railway bridge, passenger and freight trains are again running across it and from 2011 on the railway line over this bridge may convey several million of tonnes of Tete coal to the port of Beira. There are a number of small pontoon ferries across the river in Angola, western Zambia, and Mozambique, notably between Mongu and Kalabo. Above Mongu in years following poor rainy seasons the river can be forded at one or two places. In tourist areas, such as Victoria Falls and Kariba, short-distance tourist boats take visitors along the river. Sewage effluent is a major cause of water pollution around urban areas, as inadequate water treatment facilities in all the major cities of the region force them to release untreated sewage into the river. This has resulted in eutrophication of the river water and has facilitated the spread of diseases of poor hygiene such as cholera, typhus and dysentery. The construction of two major dams regulating the flow of the river has had a major effect on wildlife and human populations in the lower Zambezi region. When the Cahora Bassa Dam was completed in 1973, its managers allowed it to fill in a single flood season, going against recommendations to fill over at least two years. The drastic reduction in the flow of the river led to a 40% reduction in the coverage of mangroves, greatly increased erosion of the coastal region and a 60% reduction in the catch of prawns off the mouth due to the reduction in emplacement of silt and associate nutrients. Wetland ecosystems downstream of the dam shrank considerably. Wildlife in the delta was further threatened by uncontrolled hunting during the civil war in Mozambique. The Kavango–Zambezi Transfrontier Conservation Area will cover parts of Zambia, Angola, Namibia, Zimbabwe and Botswana, including the famous Okavango Delta in Botswana and Mosi-oa-Tunya (The Smoke That Thunders, or Victoria Falls). It is thought that the cross-border park will help with animal migration routes and assist in the preservation of wetlands which clean water, as sewage from communities is a problem. Funding was boosted for cross-border conservation along the Zambezi in 2008. The Kavango–Zambezi Transfrontier Conservation project—which follows the Zambezi River and stretches across Angola, Botswana, Namibia, Zambia and Zimbabwe—has received a grant of €8 million from a German nongovernmental organisation. Part of the funds will be used for research in areas covered by the project. However, Angola has warned that landmines from their civil war may impede the project. The river currently passes through Ngonye Falls National Park, Mosi-oa-Tunya National Park, and Lower Zambezi National Park (in Zambia), and Zambezi National Park, Victoria Falls National Park, Matusadona National Park, Mana Pools National Park, and the Middle Zambezi Biosphere Reserve (in Zimbabwe). As of 2017 the situation of overfishing in the upper Zambezi and its tributaries was considered dire, in part due to weak enforcement of the respective fisheries acts and regulations. The fish stocks of Lake Liambezi in the eastern Caprivi were found to be totally depleted, and surveys indicated a decline in the whole Zambezi-Kwando-Chobe river system. Illegal fishing (i.a. by foreign nationals employed by Namibians) and commercially minded individuals, exploited the resources to the detriment of local markets and the communities whose culture and economy depend on these resources. Namibian officials have consequently banned monofilament nets, and imposed a closing period of about 3 months every year to allow the fish to breed. They also appointed village fish guards and the Kayasa channel in the Impalila conservancy area was declared a fisheries reserve. The Namibian ministry also promotes aquaculture and plans to distribute thousands of fingerlings to registered small-scale fish farmers of the region. On 14 September 2007, epizootic ulcerative syndrome (EUS) killed hundreds of sore-covered fish in the river. Zambia Agriculture Minister Ben Kapita asked experts to investigate the outbreak to probe the cause to find out if the disease can be transmitted to humans. ^ a b c d e f "Richard Beilfuss & David dos Santos: Patterns of Hydrological Change in the Zambezi Delta, Monogram for the Sustainable Management of Cahora Bassa Dam and The Lower Zambezi Valley (2001). Estimated mean flow rate 3424 m³/s" (PDF). Archived from the original (PDF) on 17 December 2008. Retrieved 18 October 2008. ^ "Dilapidated Zambezi Source Site Worry Ikelenge DC". muvitv.com. Muvi TV. Archived from the original on 4 September 2015. Retrieved 1 August 2015. ^ "ZM002 Source of the Zambezi". birdlife.org. Birdlife International. Retrieved 1 August 2015. ^ Knifton, Dulcie (July 2004). Revise AS Level Geography for Edexcel Specification B. Heinemann. ISBN 9780435101541. ^ "Zambezi River Delta : Image of the Day". earthobservatory.nasa.gov. 29 August 2013. ^ Goudie, A.S. (2005). "The drainage of Africa since the Cretaceous". Geomorphology. 67: 437–456. ^ Moore, A.E. (1999). "A reapprisal of epeirogenic flexure axes in southern Africa". South African Journal of Geology. 102 (4): 363–376. ^ The connection between Santos/Monomatapa "Zambezi" and the "M'biza" is suggested in Cooley (1845). ^ W.D. Cooley (1845) "The Geography of N'yassi, or the Great Lake of Southern Africa, investigated, with an account of the overland route from the Quanza in Angola to the Zambezi in the government of Mozambique", Journal of the Royal Geographical Society, p.185-235. ^ a b c d One or more of the preceding sentences incorporates text from a publication now in the public domain: Cana, Frank (1911). "Zambezi" . In Chisholm, Hugh (ed.). Encyclopædia Britannica. 28 (11th ed.). Cambridge University Press. pp. 951–953. ^ Newitt, Malyn (2005). A History of Portuguese Overseas Expansion, 1400-1668. Routlege. p. 81. ISBN 0-203-32404-8. ^ Howard, Dr. J. Keir (2005). "Arnot, Frederick Stanley". Dictionary of African Christian Biography. Archived from the original on 27 September 2007. Retrieved 14 December 2011. ^ Pritchett, James Anthony (2007). Friends for life, friends for death: cohorts and consciousness among the Lunda-Ndembu. University of Virginia Press. pp. 29–31. ISBN 0-8139-2624-6. ^ Fish, Bruce; Fish, Becky Durost (2001). Angola, 1880 to the present: slavery, exploitation, and revolt. Infobase Publishing. p. 30. ISBN 0-7910-6197-3. ^ E. C. Mills: "Overlanding Cattle from Barotse to Angola", The Northern Rhodesia Journal, Vol 1 No 2, pp 53–63 (1950). Accessed 16 December 2017. ^ Visible on Google Earth at latitude -11.906 longitude 22.831. ^ Visible on Google Earth at longitude 22.924 latitude -15.214. ^ "Mongu-Kalabo Road - Zambia's Engineering Marvel". zedcorner.com. 13 April 2016. Retrieved 13 March 2018. ^ "President launches K108m Sioma Bridge – Zambia Daily Mail". www.daily-mail.co.zm. Retrieved 13 March 2018. ^ "Funding boost for cross-border conservation project". ^ a b Kooper, Lugeretzia (23 June 2017). "Zambezi fishermen warned against overfishing". namibian.com.na. The Namibian. Retrieved 24 July 2017. ^ "Zambia warns against fish killed by mysterious disease". AFP. Archived from the original on 22 January 2009. H. C. N. Ridley: “Early History of Road Transport in Northern Rhodesia”, The Northern Rhodesia Journal, Vol 2 No 5 (1954)—Re Zambezi River Transport Service at Katombora. Wikimedia Commons has media related to Zambezi. "Home Page". Zambezi River Authority. Retrieved 23 September 2012. This page was last edited on 20 March 2019, at 20:34 (UTC).